The Photo Challenge sounds like a challenge. So we will participate. The subject this week is Unusual. While driving in the Florida Keys, we encountered this in the road. It was beastly and green and unusual if you are from the cooler, mountainous region of the Northeastern US, as we are. We pulled over to watch it. And it attacked us! (Not really, but that would have been more interesting.) It didn’t do much, even with us watching it. It occasionally moved its eyes. Finally, we left and it was still in the road, not doing much. That night, I had a dream in black-and-white, 50s-style, about a Giant Iguana and Godzilla fighting around the Empire State Building in New York City. 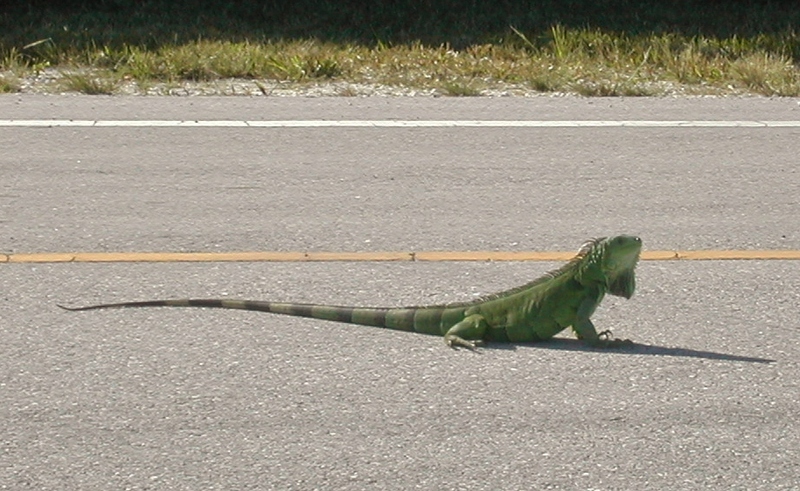 There are probably not beastly, green unusual things in the road in Florida every day. Maybe there are. We did see alligators in the drainage ditches along side the roads, but not in the roads. But we definitely do not see Iguanas in Pennsyltucky. Not in the road, in the woods, or anywhere. Except in pet stores. Would you want an Iguana for a pet? Something spiky, green and cold to hold, cuddle and snuggle. I’d rather snuggle with something soft, white and warm any day. Something fluffy, like Chopin. We love Cuties in our house. “What’s a Cutie?”, you ask. Well, besides MacGyver, a Cutie is an incredible little piece of fruit love. Cuties sell Mandarin Oranges and Clementines. Both are delicious. They’re incredibly sweet, easy to transport, easy to peel, no messy seeds, no cutting or dripping involved, they can be eaten while driving, and they’re just the right size. 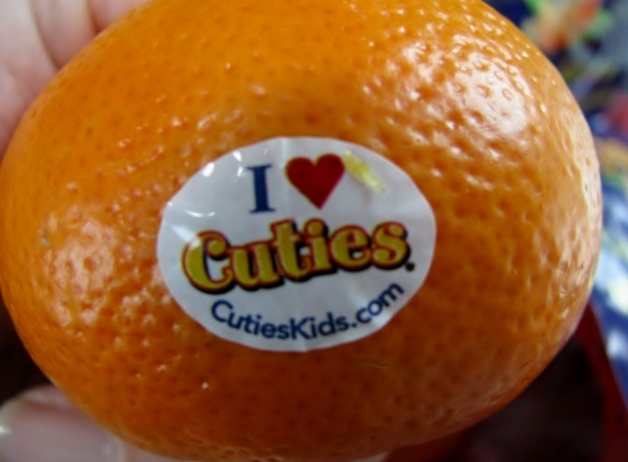 Best of all, they have these “cutie” little stickers on them. We can go through a 3-pound bag in a day during the summer. I’m the woman at the grocery store with six gallons of milk and a cart full of clementines. If you’ve never tried one, do. You’ll be hooked. Guaranteed. 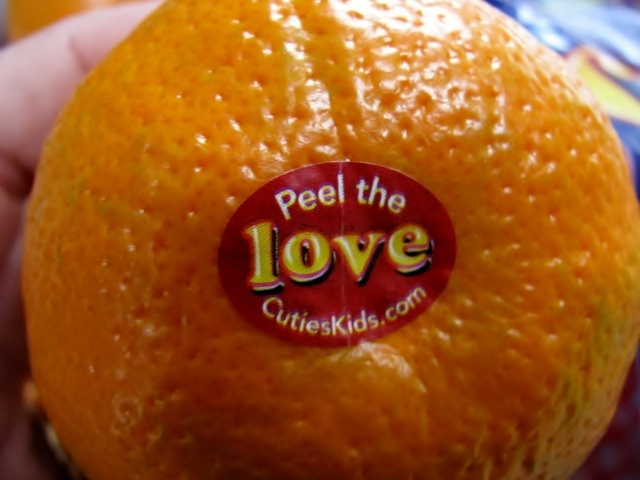 Peel the love. 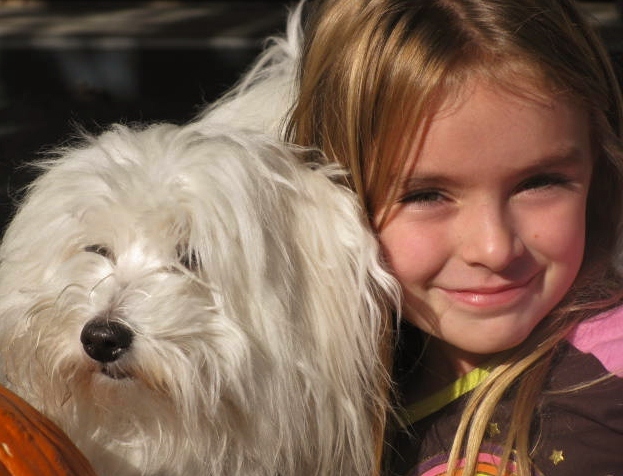 Family love, food love or pet love. Feel the love today. 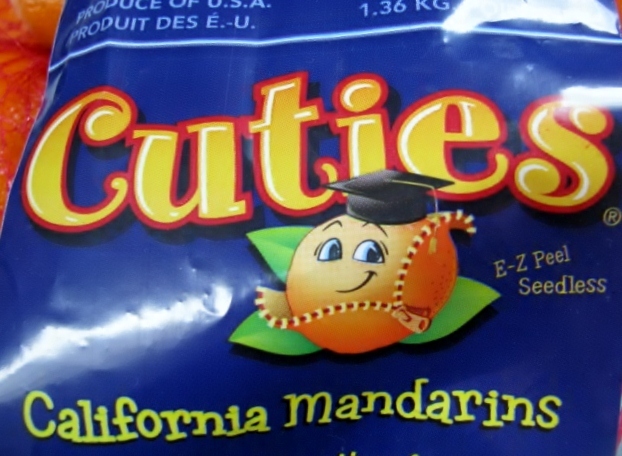 Very cool about the Cuties…never heard of them. Congrats on joining the Photo Challenge…I really enjoy it. Just so you are aware–perhaps you already are–the new ‘challenge’ is announced on Fridays. This week it is “through”. I will probably try to post mine over the weekend. I was going to post the new challenge on the Friday they announce it but I usually get the notice too late. I actually saw some bloggers posting “Through” pictures before I even knew what the challenge was. Some people are in the “know”–evidently, I am not. Have a great weekend! That’s me. Always a little behind. Thanks for the notice. I’ll be looking for a “Through” picture now. Hmmmm.